Place of death Washington, D.C.
Zachary Taylor (November 24, 1784 - July 9, 1850) was an American military leader and the twelfth president of the United States. Taylor had a 40-year military career in the United States Army, serving in the War of 1812, Black Hawk War, and Second Seminole War before achieving fame while leading U.S. troops to victory at several critical battles of the Mexican-American War. A Southern slaveholder who opposed the spread of slavery to the territories, he was uninterested in politics but allowed himself to be recruited by the Whig Party as their nominee in the 1848 presidential election. Taylor defeated the Democratic Party nominee, Lewis Cass, and became the first U.S. president to hold no prior public office. Taylor died of acute gastroenteritis just 16 months into his term. Vice President Millard Fillmore then became president. Taylor was born in Orange County, Virginia on November 24, 1784. He was the third of nine children of Richard and Sarah Strother Taylor. His parents both came from affluent families. His father was an army officer who had served with George Washington in the American Revolutionary War. When Taylor was only a few months old his family moved to a cotton plantation in Kentucky There was little opportunity for a formal education in that area, Taylor was educated by private tutors. Taylor always dreamed of being in the military. His father often entertained the family with stories of his military service in the days of the Revolutionary War. Taylor maintained his love of farming even though his career was in the military. Taylor married Margaret Mackall Smith, the daughter of a Continental Army major, in 1810. The Taylors had six children, four of whom survived to adulthood. During her husband's long army career, Mrs. Taylor followed him from on frontier post to another. As First Lady, she rarely made public appearances. In 1808, with the help of family friend James Madison, Taylor was commissioned a lieutenant in the U.S. Army; two years later he achieved the rank of captain. During the War of 1812 he served with distinction in the defense of Fort Harrison against Tecumseh's Shawnee forces in the Indiana Territory. Tecumseh was greatly admired in his day, remains a respected icon for Native Americans and is considered a national hero in Canada. Even his longtime adversary William Henry Harrison considered Tecumseh to be "one of those uncommon geniuses which spring up occasionally to produce revolutions and overturn the established order of things." During the War of 1812, Taylor became known as a talented strategic military commander. Assigned to command Fort Harrison on the Wabash River, at the northern edge of Terre Haute, Indiana, he successfully commandeered a small force of soldiers and civilians to stave off an British-inspired attack by about five hundred Native Americans between September 4 and September 15. The Battle of Fort Harrison, as it became known, has been referred to as the "first American land victory of the War of 1812." Taylor received a brevet promotion to major on October 31, 1812. A brevet rank was an honorary promotion given to an officer (or occasionally, an enlisted man) in recognition of gallant conduct or other meritorious service. Taylor was promoted to lieutenant colonel on April 20, 1819, and colonel on April 5, 1832. Taylor served in the Black Hawk War and the Second Seminole War . During the Seminole War, Taylor fought at the Battle of Lake Okeechobee and received a brevet promotion to brigadier general in January 1838. It was here he gained his nickname "Old Rough and Ready" for his rumpled clothes and wide-brimmed straw hat. 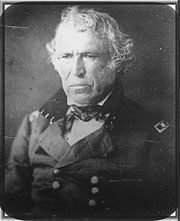 On May 15, 1838, Taylor was promoted to a position placing him as commanding general of all United States forces in Florida. James K. Polk sent an Army of Occupation under Taylor's command to the newly self-declared Republic of Texas along the Rio Grande River in 1846. Competing claims to Texas by Mexico and the United States arose in the wake of Texas declaring its independence from Mexico and the subsequent annexation of Texas by the United States. Having refused to recognize the loss of Texas, Mexico announced its intention to take back what it considered to be a rebel province. Texans strongly favored the war. In the United States, the war was a partisan issue, supported by most Democrats and opposed by most Whigs. In Mexico, the war was considered a matter of national pride. Mexico attacked Taylor's troops and was soundly defeated despite outnumbering the American force four to one. Polk later that year declared war earning the conflict the occasional title, Mr. Polk's war. The Mexican War transformed Taylor from a minor military figure into a presidential contender. He was dispatched to the disputed Texas border and won twin victories at Palo Alto and Resaca de la Palma in May 1846, several days before Congress declared war. Following the declaration, he invaded Mexico and took Matamoras and Monterrey. Taylor, however, became the object of criticism because of his alleged failure to press on following his initial success. Many later historians recognized that his caution was rooted in his lack of supplies, trained recruits and dependable transportation. President Polk, unhappy with the stalled progress, diverted a portion of Taylor’s army to Winfield Scott, who was assigned the task of taking Mexico City. Despite his reduced force, Taylor defeated General Antonio López de Santa Anna at the Battle of Buena Vista in February 1847, and immediately became a national hero. Taylor returned to his Louisiana home in 1847. He wanted to start a farm and relax in retirement after the war. However, there was talk of his presidential candidacy. His stated position was he would not actively seek the office but would accept the nomination if it were to be offered. Taylor's unpretentious ways were political assets. His long military record appealed to northerners. His ownership of one hundred slaves would lure southern votes. The Whigs nominated him to run against the Democratic candidate, Lewis Cass, who favored letting the residents of territories decide for themselves whether they wanted slavery. Millard Fillmore was chosen as his running mate. Taylor had little political experience. He had never registered to vote. He declared himself non-partisan and would not commit himself to troublesome issues. In the 1848 election, a three-way contest between himself, Democrat Lewis Cass, and Free Soil Party candidate Martin Van Buren. The main issue was the extension of slavery into the vast regions ceded by Mexico to the United States in the Treaty of Guadalupe Hidalgo, which ended the Mexican-American War. While Van Buren explicitly opposed extension, neither major-party aspirant took a clear position. Van Buren, a former Democrat, split the Democratic vote in the pivotal state New York. 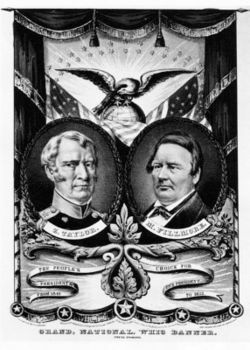 On November 7, 1848, the first time the entire nation voted on the same day, Taylor and Fillmore narrowly defeated the Democratic ticket and the ticket of the Free-Soil Party. Taylor polled 163 electoral votes to Cass's 127. He carried eight slave states and seven free states, winning half of the then 30 states. The Free Soil Party's Van Buren failed to win a single electoral vote. The Free Soil Party was a short-lived political party in the United States active in the 1848 and 1852 presidential elections, and in some state elections. It was a breakaway faction of the Democratic Party and was largely absorbed by the Republican Party in 1854. Its main purpose was opposing the expansion of slavery into the territories acquired by the Mexican-American War, arguing that free men on free soil comprised a morally and economically superior system to slavery. Taylor's greatest achievement as president was in foreign affairs. 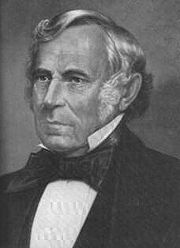 John M. Clayton, secretary of state, arranged the Clayton-Bulwer Treaty with Great Britain in 1850. This was in an effort to end British encroachments in Central America and paved the way for the building of the Panama Canal over a half-century later. Under Taylor´s administration, the United States Department of the Interior was organized, although the department had been activated under President Polk’s last day in office. He was optimistic this would help resolve the debate over congressional prohibition of slavery in any territorial governments organized in the area. Many in the South, however, feared that the addition of two free states would upset the delicate North-South balance in the United States Senate. Slavery had been the major issues in this election and would continue throughout his short presidency. Although he owned slaves, he took a moderately anti-slavery position. Taylor believed that the people of California and New Mexico should be allowed to decide for themselves whether or not to permit slavery by writing constitutions and applying immediately for statehood. In an attempt to mollify the South, the adoption of a second Fugitive Slave Act was proposed. It would mandate the return of escaped slaves apprehended anywhere in the nation. This effort would become the Compromise of 1850. On July 4, 1850, a blistering hot day, Taylor attended the ground breaking ceremonies of the Washington Monument. Later that day, Taylor took a walk along the banks of the Potomac River. When he returned to the White House he was dehydrated and exhausted. He drank a pitcher of buttermilk and a large quantity of cherries and other fruits. Later that evening he developed violent stomach cramps and a dangerously high fever. Diagnosed with a form of cholera associated with raw fruit, he died five days later. The funeral route was lined with more than 100,000 people to see their president laid to rest. He left behind a country sharply divided and a vice president, Millard Fillmore, who supported the Compromise of 1850. In the end, Taylor had limited personal impact on the presidency, and his months in office did little to slow the approach of the great national tragedy of the American Civil War. He is buried in Louisville, Kentucky, at what is now the Zachary Taylor National Cemetery. Some historians suspected that Taylor's death might have had other causes. In 1991, Taylor's descendants, convinced that the president might have suffered arsenic poisoning, had Taylor's remains were exhumed from a cemetery in Louisville and Kentucky's medical examiner brought samples of hair and fingernail tissue to Oak Ridge National Laboratory for study by forensic scientists Larry Robinson and Frank Dyer. Investigating the possibility of assassination by means of deliberate poisoning, Dyer and Robinson detected traces of arsenic and sent the results to a Kentucky medical examiner, who determined the quantity was insufficient to have been fatal. Margaret Taylor lost her spirit and her will to live with the death of her husband. She died two years later, on August 18, 1852, at the home of her daughter Betty, in Pascagoula, Mississippi. Taylor's son Richard Taylor became a Confederate lieutenant general, while his daughter, Sarah Knox Taylor, had married future president of the Confederate States, Jefferson Davis, three months before her death of malaria. Taylor's brother, Joseph Pannill Taylor, was a brigadier general in the Grand Army of the Republic during the Civil War. Taylor's niece, Emily Ellison Taylor, was the wife of Confederate General Lafayette McLaws. 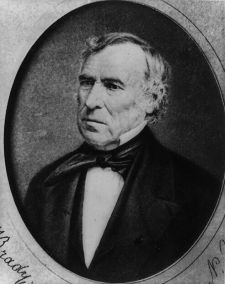 Taylor's term of service was scheduled to begin on March 4, 1849, but as this day fell on a Sunday, Taylor refused to be sworn in until the following day. Vice President Millard Fillmore was also not sworn in on that day. As a result, it is often claimed that the previous president pro tempore of the Senate, David Rice Atchison, was "president for a day," or that the presidency was vacant. Most scholars believe that according the United States Constitution, Taylor's term began on March 4, regardless of whether he had taken the oath or not. It is believed that Taylor sometimes needed to be boosted into his saddle, since he stood 5 feet 8 inches or 5 feet 9 inches (172-175 centimeters) tall. He weighed between 170 and 200 pounds (80-90 kilograms). Taylor always preferred old and slovenly clothes (including his unique straw hat) to military uniforms, leading to his nickname, "Old Rough and Ready." In 1942, a Liberty ship named the SS Zachary Taylor was launched. The ship was scrapped in 1961. Taylor was a poor writer and had difficulty spelling. ↑ Quoted in Sugden, 215. Hamilton, Holman. Zachary Taylor: Soldier of the Republic 2 vol (“Soldier of the Republic," "Soldier in the White House”). Norwalk, CT: Easton Press, 1989. All links retrieved October 24, 2016. This page was last modified on 24 October 2016, at 16:43.